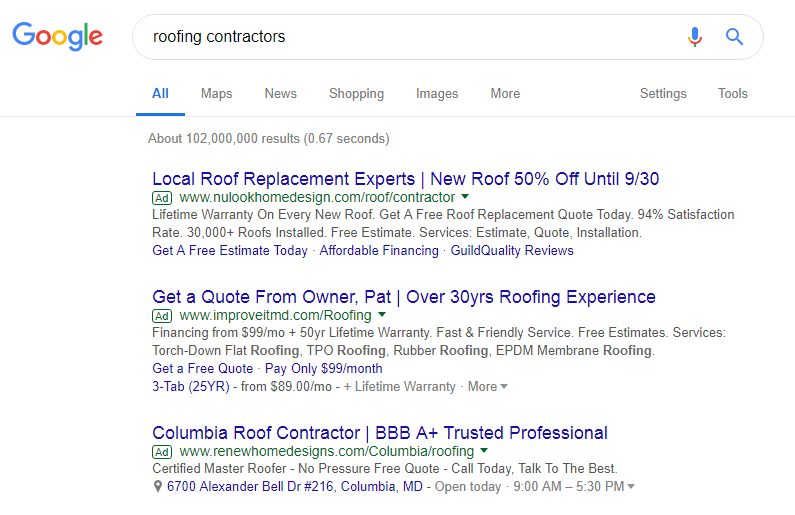 Roofers not using PPC are missing a huge opportunity to connect with customers. There are over 140,000 roofers in the United States according to the bureau of labor statistics. Anyway you split it, that is a lot of competition for residential and commercial roofing leads. With everyone trying to reach new customers, roofers need a marketing plan to be successful. With so many digital marketing options, it can be hard to choose the right one. Thankfully, we are here to help. Read on for 5 reasons why a PPC campaign is right for your roofing business. Long established roofers have clear marketing advantages over newer roofing companies. These advantages can include widespread name recognition, organically ranking on the first page of Google, well developed email marketing lists, and large social media audiences. Newer roofing companies can use a PPC campaign to overcome these advantages and close the marketing gap. Roofing companies can hire paid search marketing experts who can set up PPC campaigns in days or weeks. In no time at all roofers can send traffic to an optimized landing page and begin capturing leads. PPC Campaigns are a proven way to quickly close the marketing gap between new and established roofing companies. While certain marketing activities can be hard to track and measure, this is not the case with a PPC campaign. Google and Bing track every ad impression, click, and conversion, removing any ambiguity from the results of your PPC campaign. Using this wealth of analytical data allows roofers to see the exact state of your marketing. The statistics are immediately available and can be used to quickly modify campaigns based on what works. There are very few forms of marketing where data driven decisions can be used in almost real time to improve results while reducing costs. Additionally, it is very easy to quantify and calculate ROI from PPC marketing. With proper call and conversion tracking, roofers can easily determine their exact cost per lead (great for comparing to Angie’s List and HomeAdvisor) and the resulting sales from those leads. With the rise of sites like Angie’s List, HomeAdvisor, and YELP, it is harder and harder for roofers to have their website show up on the first page of search results. However, 98% of people never look at the second page of Google or Bing. PPC advertising is an easy, reliable, and guaranteed way of showing up on the first page of Google and Bing when people look for roofing services. Even if your website does appear on the first page organically, PPC still might be necessary. Google shows 4 ads, followed by the Google Maps results (which can contain 1 more ad) before it shows organic results. This means your customers could see up to 8 other roofing businesses before they see yours. Again, a PPC campaign can guarantee your roofing business shows up at the top of the first page of Google. PPC campaigns give roofers total control over their online advertising budget. This control extends well beyond the total budget. Roofers can control the precise amount they are willing to spend on every keyword, across multiple channels. For example, roofers can budget $12 for the keyword “best local roofer” on mobile phones in one zip code and $10 in another. More importantly, budgets can be increased, decreased, and even halted altogether at a moment’s notice. If a roofer using PPC hits capacity with an 8 week backlog, then pause their ads entirely right from their phone. This prevents wasteful spending for leads that cannot be chased. Conversely, a billboard or radio advertise cannot be stopped on a dime, and could produce leads that cannot be followed up. Not only do PPC campaigns give roofers total budget control, they also allow for very specific targeting. Consider the billboard mentioned above. Roofers can make a best guess about who will drive past it based on the location, but ultimately have no control over who is in the car. Thanks to geographic targeting, roofers can have their ads only show up in specific locations where they want to work. Essentially, roofers can pick what cars drive pass their billboard using PPC. Even better, roofers can use negative keywords to eliminate their ads showing up for irrelevant services. A roofer who only does asphalt shingle roofs, can block their ad from appearing for any searches involving terms like metal, TPO, membrane, or EPDM. Beyond location targeting and negative keywords, roofers can also target by device type, operating system, browser, and mobile carrier to name a few additional options. As you can see, there are great reasons for roofers to run a PPC campaign. Roofers can quickly set up highly targeted ads and get on the front page of search engines. Inbound leads are easily tracked and quantified to calculate ROI. All without going over your marketing budget. If you are interested in learning more about how a PPC campaign can help market your roofing business contact us. At AltaVista Strategic Partners, we specialize in developing roofing contractor marketing campaigns to attract, convert and retain customers.